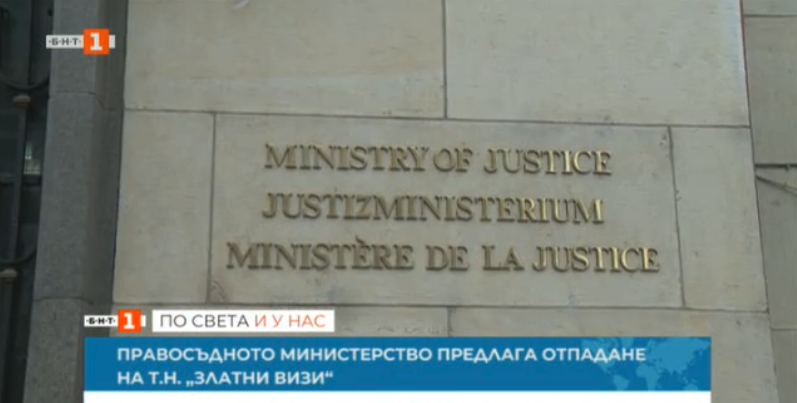 Justice Ministry proposes removal of the so-called "Golden visas"
Bulgaria’s Ministry of Justice said on 22nd of January it was envisaging to put an end to the so-called "golden visas" - gaining Bulgarian citizenship by investment. The reason is that this has no lasting positive effect on the Bulgarian economy. The ministry is considering legislative changes that will be discussed next week. According to the ministry, Bulgaria is mentioned in the report not as a risky state but as a country in which there is such a procedure. The so-called "Golden Visas" were introduced through the Bulgarian Citizenship Act in 2013 and currently provide Bulgarian citizenship to foreigners who invest between BGN 1 and 2 million in business in Bulgaria. At the time of introducing it, the expectation was that the measure would lead to more jobs and economic growth. An analysis by the justice ministry, however, shows that today there is a huge difference between expectations and reality. Desislava Ahladova - Deputy Minister of Justice: Only four people have benefited from this opportunity, ie the intended result by these provisions has not achieved the expected effect. The four foreign investors have "bought" their citizenship with government bonds. Desislava Ahladova - Deputy Minister of Justice: It is very common that an investment exists until the person is granted the citizenship, but then it is not maintained. Ekaterina Zaharieva - Minister of Foreign Affairs: The Bill proposed by the working group in the Ministry of Justice will be discussed by the Development Council. There the directions of the amendments are not only related to the acquisition of Bulgarian citizenship by investments. The other changes envisaged include: exams in Bulgarian language, history, knowledge of institutions and availability of work of citizenship candidates on the grounds of origin. Desislava Ahladova - Deputy Minister of Justice: This way, we believe that there will be no cases in which a person applies for citizenship only in order to be able to go to the European Union and work there, i.e. he really needs to feel a Bulgarian citizen to get citizenship. The draft amendments will be discussed on January 30 at the Council of Ministers’ Development Council.